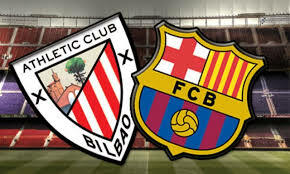 Athletic Bilbao welcomes the champion Barcelona in a match from the 23th round of the Spanish La Liga. Let’s see what’s going on with these two teams before their clash at the Estadio San Mames Barria. Athletic Bilbao are currently 12th in the standings with 26 points. They have 5 wins, 11 draws and 6 losses. In their last five games the Basques are pretty good – three wins, one draw and only one defeat. This loss came in the previous round, when Athletic lost the Basque derby against Real Sociedad at the Anoeta. Raul Garcia scored for Athletic, but Sociedad took the win with goals from Mikel Oyarzabal and Willian Jose. There was a moment in the season when Athletic were pretty close to the relegation zone. But now they are improved and in a much better position. Barcelona are leaders in La Liga with 50 points. They have 6 points advantage in front of the 2nd Atletico Madrid. Barca’s record in the league so far shows 15 wins, 5 draws and 2 losses. Ernesto Valverde’s team is once again the favourite to win the title. In their last five games Barcelona are pretty efficient – four wins and one draw. This draw came in the previous round, when the Catalans finished 2-2 with Valencia at the Camp Nou. It was Leo Messi who saved the point for Barca, scoring two goals in Valencia’s net. During the week Barcelona had an El Classico against Real Madrid for the Copa del Rey, so be aware that they might be a little bit tired in Bilbao. Most likely the manager Ernesto Valverde will make some changes in his starting line-up, giving a rest to some key players. This is what we had to say about the La Liga clash between Athletic Bilbao and Barcelona at the Estadio San Mames Barria.